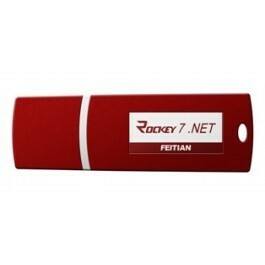 ROCKEY7.NET is the ideal solution to protect .NET application against piracy. The 32bits high performance smart card chip based hardware with built-in .NET virtual machine allows .NET applet being executed onboard. Software developers can download .NET applet to the device and make it work with outer .NET application. The secure communication technique is applied to protect the data transferred between the device and host machine. Each ROCKEY7.NET dongle can run multiple .NET applets simultaneously so as to protect multiple .NET application at the same time. 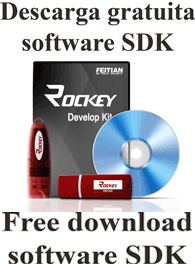 The design of ROCKEY7.NET follows the up-to-date .NET technology. Its stable and effective performance provides excellent protection to Microsoft .NET applications. The product provides a smart encryption tool for .NET code functions, which can automatically analyse the target .NET program and download a part of the key elements to smart card (chip) for effective protection. The protected elements are implemented by .NET applets in the dongle. Thus, the entire program body will never appear on the computer. This prevents tracing and de-compilation. The accompanying envelope encryption tool automatically protects software, or adds other auxiliary protection means, such as anti-debugging. In addition, a user initialization tool, a production tool, and a remote update tool are also available for easier use of the product. ROCKEY7.NET is an excellent .NET program protection solution. It makes the application invulnerable. Developer does not need to program. The enveloper tool can analyze and protect the application automatically. The solution provides multiple binding conditions to control the application delivery. Like bind with hardware ID, bing with user ID. The device is driverless in all Windows systems. The remote update tool allows vendor to control the end-user's device remotely without call back the hardware dongle. A series of management tools like the initialization tool, production tool etc. are provided according to real software management roles.